Oh, you beautiful Switzerland! 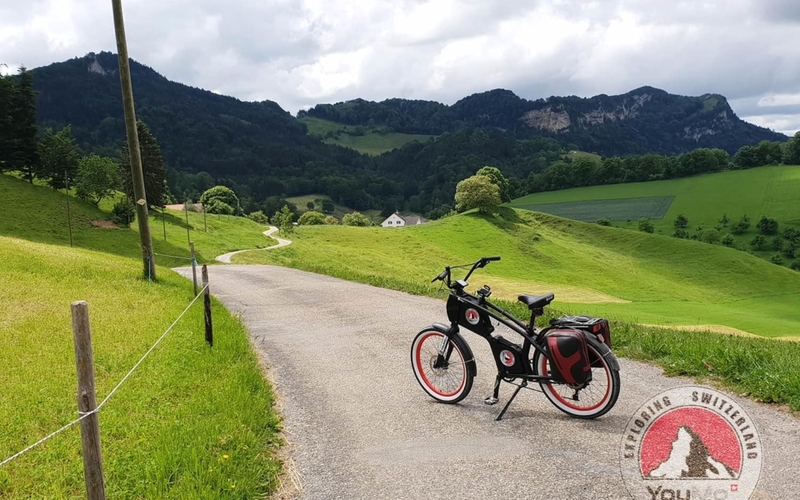 That’s what our friend Reto Frischknecht was thinking and why he has decided to go for an exciting Bike tour through several cantons and the most beautiful places of Switzerland. 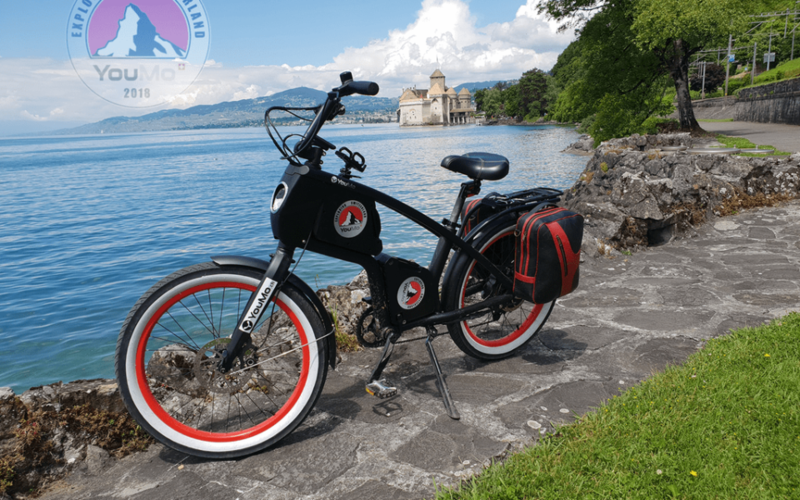 What would be such an e-bike tour without the possibility to share all the impressions and experiences with the world! In our blog you’ll find all his daily reports, pictures and the interactive map of his route. 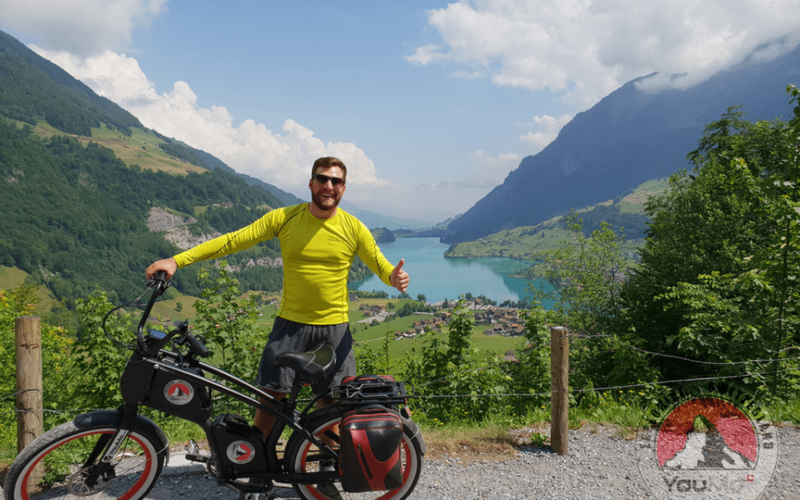 Follow Reto in his adventure and explore Switzerland with him in a way you didn’t know it before! I was busy the whole afternoon on Thursday to pack the seven things for my Swiss tour and on Sunday afternoon I started the test drive with all my luggage. The aim of this “smaller” test drive was to put the luggage and the YouMo through their paces. Luckily the weather was wonderful and so it looks like I will be spoiled with a lot of sunshine for the next days. Since I was still at a festival the evening before, I only started in the afternoon on two, luckily without a big hangover from the evening before. From Unterohringen, my home, I set off through the sparsely populated Zurich wine country along the Thur to the Rhine Falls in Laufen Uhwiesen. Most of the time I did on marked cycle paths and side roads with little traffic. Especially from the place Gütighausen (until now the place was completely unknown to me) I was impressed. Directly next to the Thurbrücke Gütighausen, various bathing areas invite you to linger at the Thur. I was also told that camping Gütighausen must be beautiful. For all camping lovers surely worth a stop during the summer. 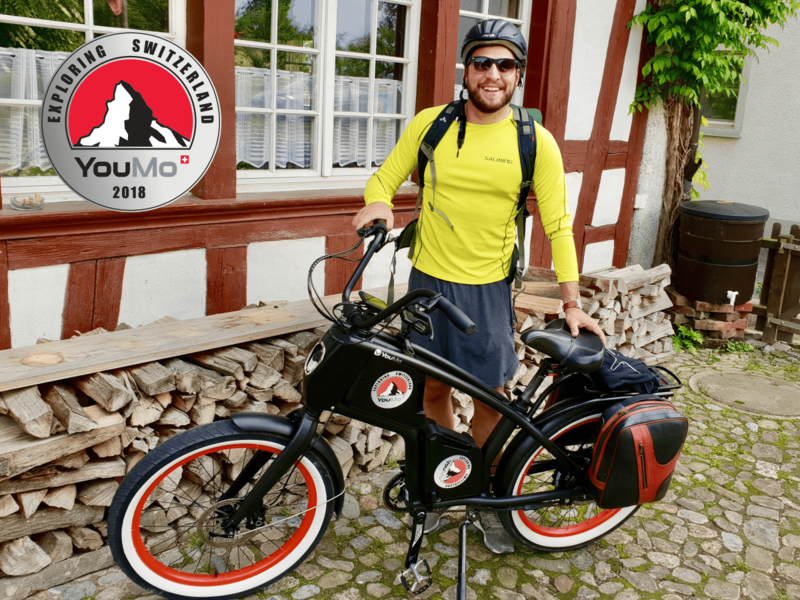 After about 1 ½ hours on the YouMo with the smallest possible electrical support I reached the Rhine Falls in Neuhausen. As expected on such a beautiful Sunday there were tourists everywhere, especially many from India and China. I cruise by bike along the ob-servation deck and attracted almost more views than the Rhine Falls themselves. After a short stop at the Rhine Falls I headed for Schaffhausen. Above all the beautiful Altstatt in Schaffhausen with its many restaurants and seats in the alleys invite you to linger. A short detour up to the Munot, the landmark of Schaffhausen, was a must for me. With the YouMo the gradient was no problem either. Arrived on top of the Munot, I enjoyed the evening mood on Schaffhausen. Since I wanted to return to Unterohringen before daybreak, I didn’t have long time and so I started my way back. I chose a dif-ferent return route because I wanted to explore the whole wine country. After Benken I took the side trip to the right towards Andelfingen. Especially the typical farmhouses with the red painted bars can be seen everywhere in the small villages in the wine country. Also in Andelfingen there are many such traditional houses to admire. According to the local authorities, Marthalen is also worth a visit in this respect. After passing through the village I started the last part of my test tour. From Humikon I cycle directly through the villages Henggart, Hettlingen back to Unterohringen. After about 3 h driving time and about 65 test kilometers I arrived in Unterohringen in the evening. After this material test you can now definitely start the right tour. 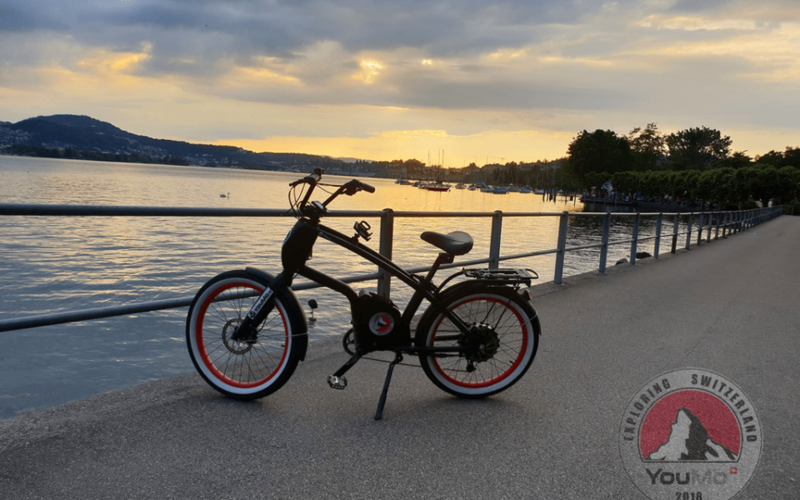 Yes, today is finally the day – my eBike tour through Switzerland starts in bright sunshine! The first part of the cycle route leads me along a guided cycle path to Freienstein Teufen. From Freienstein Teufen there is a short descent to Tössegg, where the Töss flows into the Rhine. 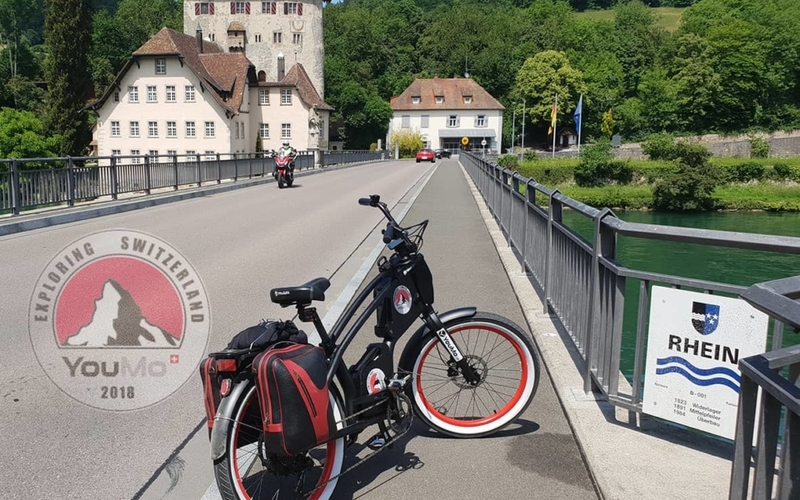 This beautiful place with restaurant and landing stage invites you to stay, but after the obligatory photo stop with the YouMo I want to continue along the Rhine on a gravel cycle path to Eglisau. So far everything is going according to plan and I am making good progress with an average speed of 24 km/h. But on the way to Weiach it happens: I notice that my right pedal is tilted and releases from the pedal hinge. I can’t take it anymore. So I immediately make an emergency stop and try to repair the pedal with my own tools. Since I am not equipped with large tools, I use my smartphone to find the nearest bicycle mechanic, who is about 4 km away in Hohentegen on the Hochrhein in Germany. Thanks to full battery support, I can pedal with only one leg and quickly make the detour to Germany. About 1,5 km after the border I drive up at Schneider Bikes. Although the thread is slightly damaged, they can repair the pedal in a short time, so that I can drive on after only ½ hour. I take the detour to Germany and drive past the small Swiss village Kaiserstuhl AG, which exudes a lot of charm for a short visit with its old historical buildings under monument protection. 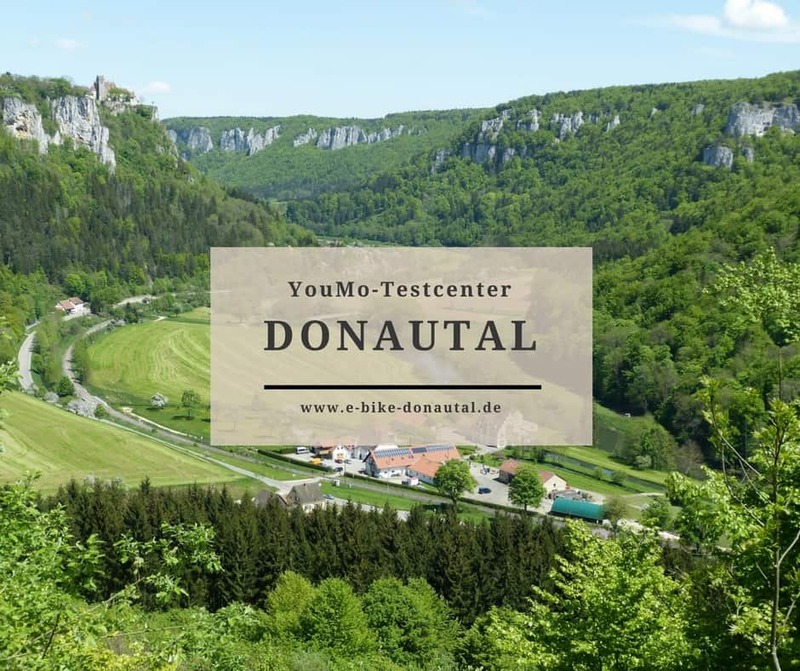 As I later learn on the Internet, Kaiserstuhl with 0.32 km2 is the smallest municipality in Canton Aargau and together with Gottlieben and Rivaz (also 0.32 km2) is one of the smallest municipalities in Switzerland. After the oblique photo in the pretty town I head towards Bad Zurzach, which in Switzerland is famous for its themal bath and the zoo. From Bad Zurzach follows a short ascent with a rapid descent to Teger-felden. From there across the canton of Aargau to Brugg. From Brugg to Schinznach Bad I cycle along the Aare. After Schinznach Bad it is only a stone’s throw to Lenzburg, where I would like to visit Lenzburg Castle. Since it is already after 5 pm, however, I will postpone the visit until tomorrow and start the bypass of the Hallwillersee today. At Seengen, the northernmost community at Lake Hallwillersee, I make a short photo stop at the famous Hallwyl Castle. 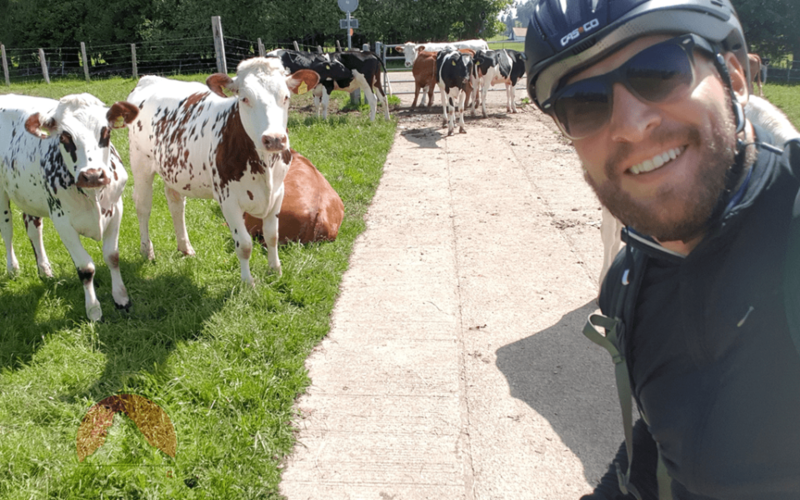 Afterwards I go to the bypass, at Aesch I make a short stop and choose the over-night stay for tonight and find something at a nice Bed and Breakfast on a farm in Bettwill. After Meis-terschwanden follows my last ascent of today to the highest village in the canton of Aargau. After about 5 hours on the saddle with tired legs I am looking forward to a shower and the deserved night’s rest. Day 2: 29.05.2018 Are there passes In Basel-Land?! It has also been easier for me to get up. 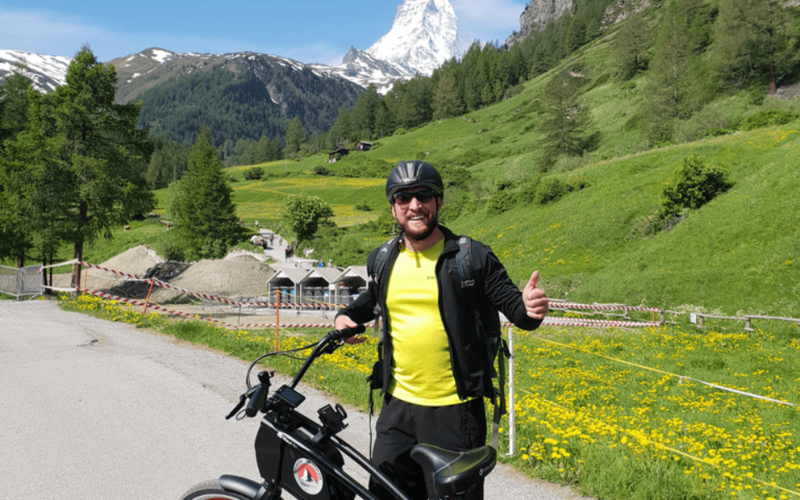 My legs still feel very heavy in the morning from yesterday’s stage of my e-bike tour, and at the same time I have planned a stage with more vertical meters for today. But the breakfast from BnB Bettwil leaves nothing to be desired, and so I start to Lenzburg around 9 o’clock with a full stomach in mixed weather. After about 45 minutes I reach Lenzburg Castle, where I park my YouMo and visit the castle and museum. The tour through the castle is very interactive and exciting, and I would highly recommend a visit to Lenzburg Castle to anyone nearby. After about 2 hours of tour of the castle, including a large refreshment in the castle café, I leave for Aarau around noon. Although I have only completed a few kilometres, my legs feel very heavy today, I continue to trample and hope that this will soon improve. After another 45 minutes I reach Aarau, I cruise with the YouMo through the alleyways of the city centre and take an obligatory photo before I continue. After Aarau I cycle for a long time, mostly on small gravel roads along the Aare through Niedergösgen, past the Gösgen nuclear power station, past Winznau to Trimbach. After Trimbach follows the first smaller mountain prize of today’s stage, the Pass Hauenstein. Although it is only a small pass, it has nice large curves and is very popular with motorcyclists. My legs feel fresh like a miracle since I entered the Hauenstein Pass, and I no longer feel tired at all. Arrived up in Hauenstein, I thought most of it was done, but I was really excited. The steepest ascents are still to come. First we take an unpaved side road through the forest with a 20 percent gradient up to Challhöchi. When I reach the top I am rewarded with a wonderful panorama of the Belchenflueh. Unfortunately, the Challhöchi is not yet the highest point of the crossing and so further ascents follow up to the Belchen Pass. The upper part of the little frequented Belchen pass is really tough again, and despite the e-bike on the second stage, my sweat only runs down. So that I and the engine do not overheat, I take a small break before the pass height. Finally at the top I am rewarded again with a magnificent view. I tackle the fast and long descent in the direction of Langenbruck BL. During the descent my eyes wander over the hills of Basel Land again and again, and I am nevertheless very surprised how hilly the area is. I thought the whole thing would be kind of flatter. After a short break in Langenbruck I tackle the big mountain prize up to the Scheltenpass. This connects the cantons of Solothurn and Jura. After Mümliswil the road climbs slightly to the cross-roads, where you can either pass the Passwang or the Scheltenpass. Since I want to go to Delemont, I have no choice but to scold him. At the beginning it is still gentle, but towards the end it becomes steeper and steeper, especially in the upper section. To conserve the battery, I’m taking the whole pass to level one. My sweat is running down and for the first time I wonder why I didn’t take the easier route without crossing the pass to Delemont. 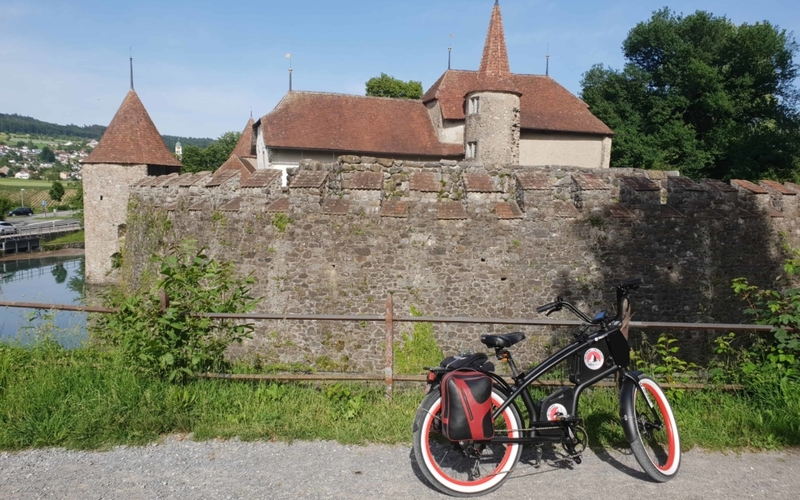 At the top the thought is quickly forgotten, and I tackle the last stretch through the small villages in the Jura. After about 5.5 hours driving time I reach Delemont healthy and happy at 7 pm.. The third day of my Tour de Suisse starts with wonderful cycling weather. I slept well and my legs feel fresh too. These are simply the advantages of a YouMo! I look forward to my stage and hope to reach Creux du Van in Neuchâtel in the evening. After a rich breakfast from BnB Passifleur in Delemont I start my tour at 9 am. The first 15 kilometres go relatively flat along the valley to Glovelier. In Glovelier the ascent into the Jura Mountains to Saint-Bras starts. The gradient is quite steep at the beginning with about 12 percent, but then flattens continuously. Over a distance of about 8 kilometres, you climb 450 metres up to an altitude of almost 1000 metres. Once you have reached the top of the mountains, you drive along various small villages and an idyllic landscape with wonderful views. Traffic along the main road is also limited, and it feels as if the clocks are turning a little slower here. After about 3 hours driving through the Jura mountains I reach La Chaux-de-Fonds at noon. In a recommended Creperia on TripAdvisor I eat a salty crepe for lunch and then cruise through the city. There is no really pretty old town in La Chaux-de-Fonds, as the city was completely destroyed by a major fire in the 18th century. After that, the city was rebuilt like a chessboard according to the American model. The city seems to me somehow special with the many Art Nouveau buildings and their corners. Somehow, I remember my trip to America and the big American cities, where you could look down a street to the horizon. La Chaux-de-Fonds, located at 1000 metres above sea level, is also one of the highest cities in Europe. The city is best known for its large watch industry, and so I decide to visit the Watch Museum (No. 1 Rating on Tripadvisior area activities). The Musée international d’horologie is equipped with many international watch exhibits and really very exciting. Unfortunately, a large part of it is currently under reconstruction, and the museum is not really interactive. But if you are interested in watches and are in La Chaux-de-Fonds, you should definitely visit the museum. 3300 meters from the crater rim at noon. At 5 pm I arrive in Noiraigue, and my Google bike navigation shows me around 4.5 kilometers and around 600 vertical meters to the summit. I’m expecting an hour and hope to be at the summit at 6:00 p.m. After a short asphalted road I turn into a small forest path, which climbs very steeply. At first I manage to trample in the lowest gear with the full support of YouMo. The gradient becomes so steep, however, that despite my support I don’t stand a chance and start pushing the e-bike. I wonder why my Google bike navigation suggests this way to me and curse aloud. Even with a bike-bike and lower gears this gradient is hardly feasible. Whenever I try again to ride a small piece, the engine of the e-bike overheats, and I have no choice but to push. The path is simply too steep for any kind of vehicle! After an hour of fighting with myself and the YouMo I arrive at a clearing with a self-service restaurant. On the GPS it is still 1.8 kilometres, and I hope that the worst part is done. Unfortunately, far from it. It goes further into the forest, the path is only half a meter wide, and it goes up the forest steeper and steeper. Rootstocks follow first, then big stones. I now know that I am on the hiking trail and certainly not on the cycle path. I have to lift my bike and my lug-gage again and again over big stones (like steps). At some point 1.2 kilometres before the end the path becomes so steep and impassable that I have to stop the Creux du Van project after 2 hours of fighting and countless lost nerves. I fight my way back down the mountain on my bike and I am very happy when I arrive back in Noiraigue in one piece. I can-cel the accommodation on the Creux du Van and find a small room in a BnB in Travers. 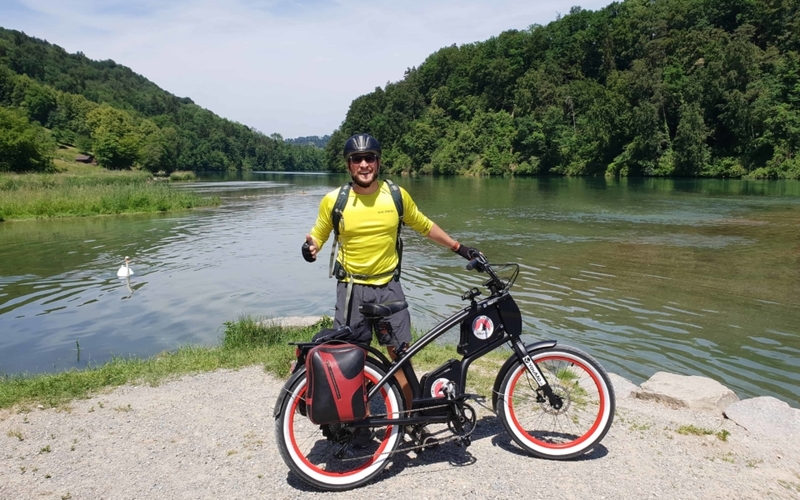 When the host welcomes me in Travers and he sees my dirty e-bike including my legs smeared with dirt, I tell him my story and he just shakes his head and tells me that it is impossible to come up this trail by bike. Yes, the dear Creux du Van demands everything from me so far, and so I decide to try again tomorrow with a bike path recommended by the BnB owner. First I’m going to try the Creux du Van for the second time in cloudy weather. This time the route sug-gested by the BnB owner is a nice cycle route, and after about an hour I arrive at the Creux du Van. Just as I reach the top, the cloud cover opens and the sun comes out. What a wonderful sight, this “Grand Canyon” of Switzerland. This morning’s climb was definitely worthwhile for this view. After a short walk and snack before the abyss I pack my YouMo and set off for Yverdon le Bais. 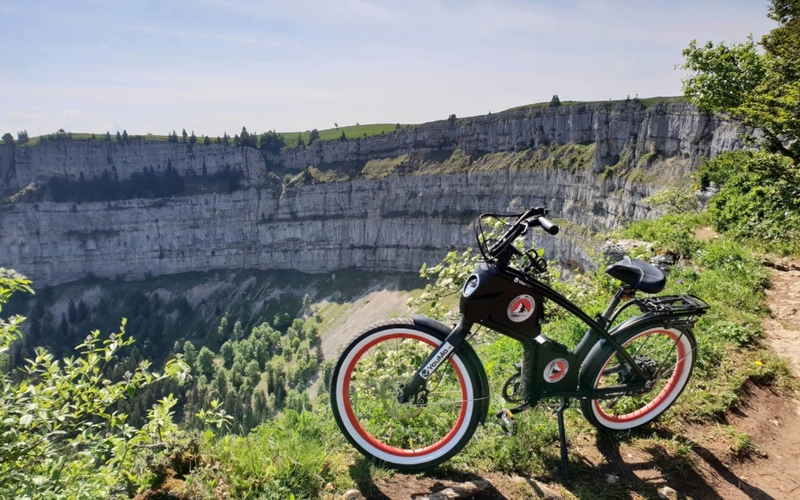 The descent from Creux de Van to Provence is wonderfully beautiful with a view of Lake Neuchâtel. I drive along Lake Neuchâtel, through Yverdon les Bains and across the canton of Vaud. I am always amazed by the many beautiful little villages and the place names I have never heard of. In Bercher, about 20 kilometres before the finish line Forel, the sky suddenly covers and it starts to rain heavily. I manage to find shelter at a station with a small self-service restaurant and a small zoo and start waiting. It pours and pours, and for the time being there is no thought of continuing the journey. I keep checking the rain radar and see that there is no improvement in sight. It is still about 1 hour drive to Forel, and after about 45 minutes I decide to continue in my rainsuit, so that I arrive in Forel before nightfall. After a short time in pouring rain my shoes are completely soaked, and I regret that I do not have such velogamas as the Germans in my luggage. Luckily my luggage stays dry thanks to plastic bags and rucksack cover, and I arrive in Forel just in time before dark, where I can move into the guest room of an acquaintance. Many thanks to Chrigä and Marco Schläppi for letting me stay with you for one night. Day 5 of my tour takes me along Lake Geneva to Montreux and then to Valais. About 90 kilometers are planned with the final destination Sion. 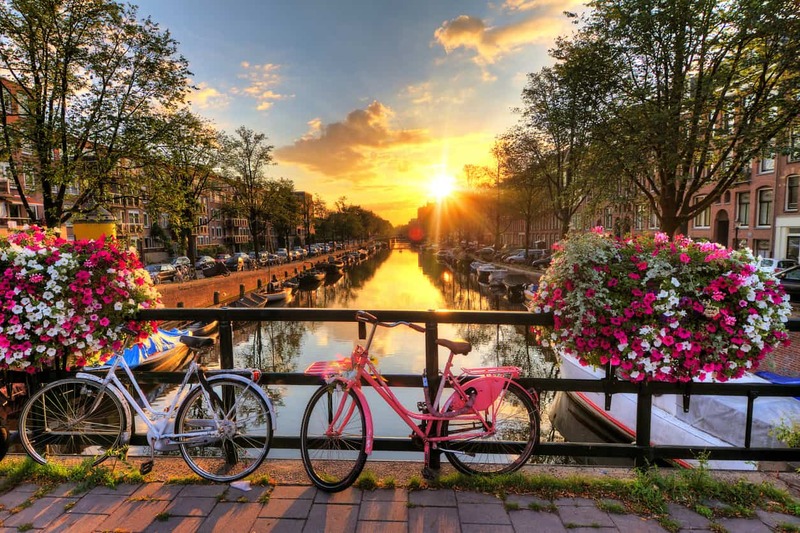 The day starts again with wonderful cycling weather – I am so lucky so far, Peter must have been a experienced cyclist. After a short descent from Forel to Grandvaux, my breath is already gone for the first time, the view in the morning down to Lake Geneva with the many small villages in the slope is simply wonderful. But as if that wasn’t enough, my absolute track highlight follows this tour so far! The drive through the wine villages Riex – Espesses – Chexbres – Rivaz about 200 meters above Lake Geneva between the vines knocks me out. I always have to stop and take a few pictures. 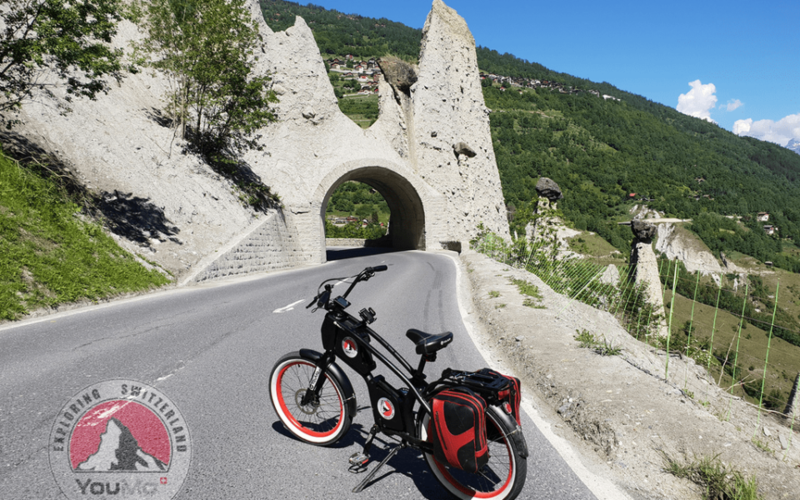 This slope route is highly recommended for anyone planning a bike tour near Lake Geneva. After this wonderful trip the route leads directly along the lake through Vevey to Montreux and Villeneuve. Unfortunately, the cycle path along the lake is populated by so many tourists and locals that you have to slow down again and again. Montreux seems like a tourist stronghold to me anyway, and I am glad to have made it through the masses in one piece. After Montreux I pass the Chillon Castle , which is already very majestic. Although I am only 5 days on my tour, I have already seen some famous and also unknown beautiful castles and fortresses. I notice that Switzerland is a country full of castles and fortresses. My research on the Internet revealed that there are still about 540 castles and fortresses in Switzerland. Since my day trip goes on for a while and many tourists are queuing up in front of Chillon Castle (the most visited historical building in Switzerland), I do without the tour of the castle, take the obligatory photo and continue through the valley to Martingy. The distance goes straight out, and so I drive with my YouMo an average speed of about 30-32 km/h and progress so quickly. 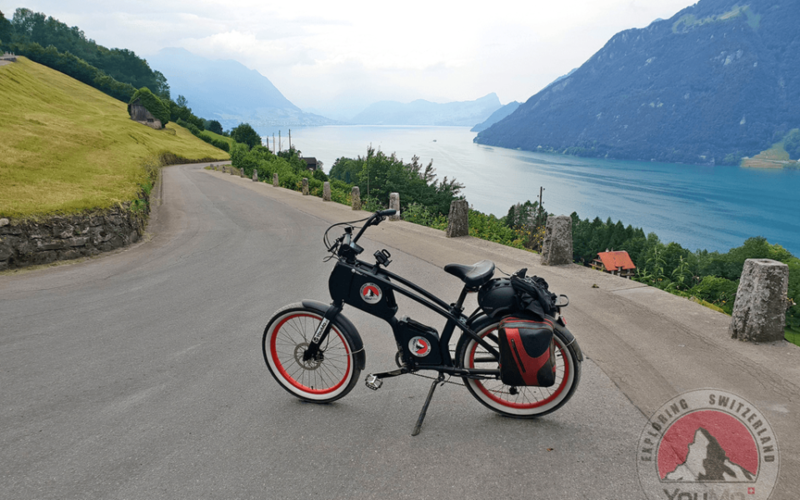 The battery is no problem at all when touring at low altitudes and, if you go straight ahead, will last for 100 kilometres. In Martingy I make a short coffee stop on Place Central and look for a suitable accommodation. There I see a wonderful accomodation wit a small wellness area in Veysonnaz at about 1200 meters above sea level with a view over Sion and decide spontaneously. So I accept about 1000 more vertical meters and 10 kilometers more. 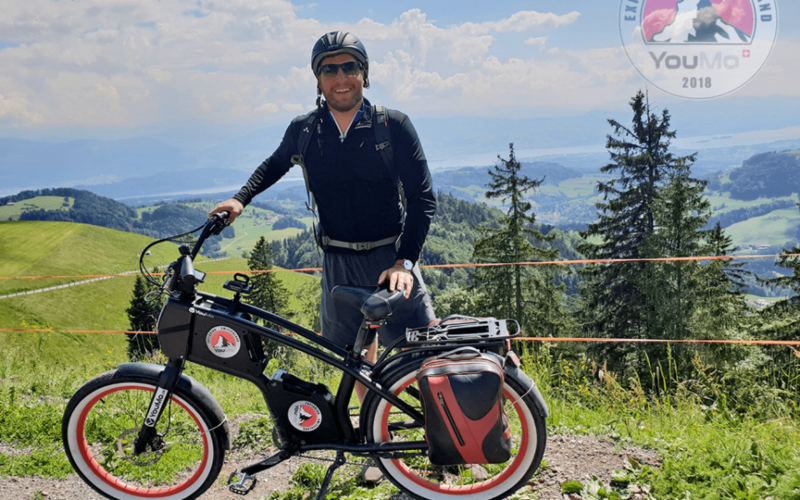 The 1000 height meters spread over about 8 kilometers are really tough, and after Coor there are some sections with such an incline that every e-bike is powerless and I have no other choice than to push up the bike a few sections. As soon as I get back on the e-bike and try to trample, the engine overheats due to the gradient and I have no choice but to wait until the engine cools down again, or simply to trample without support. For the first time I also discover a gradient sign, where, believe it or not, 50% is indicated! I don’t think I see right at first, but now I know what 50 percent gradient feels like. It also becomes clear to me why cars are no longer allowed to pass. After 1 ½ hours of fighting I am rewarded with a wonderful view and a small wellness area. The efforts are quickly forgotten and I am convinced that I will sleep well again tonight. After yesterday’s arduous ascent to Veysonnaz, I am looking forward to the descent to Vex this morning. The view of Sion with the enthroned castle down on the valley is wonderful. I am glad that I already made the altitude meters yesterday, because also my next stopover Euseigne is about 500 meters above Sion and I can save myself these altitude meters. From Vex the path leads quite straight into the valley basin to Euseigne. And I can already see the pyramids of Euseigne for the first time from a distance of about 2 kilometres. From a distance the 15 meter high pyramids don’t look very spectacular, but the closer you get, the more you become aware of their size. Especially the passage through the tunnel of the pyramids by e-bike is special. According to my research, the pyramids were formed in the final phase of the Ice Age some 10,000 years ago by erosion processes and are today one of the most important geological sights of the Alps. They are also protected. On the tops of the pyramids there are also firmly seated boulders which press on the pyramids and protect them from the weather. As soon as the tips lose their protective caps, they are exposed to the weather and will disappear again within several decades or centuries. So it’s worth visiting them first. I cycle with the YouMo through the village of Euseigne, turn around and cycle back to Vex. 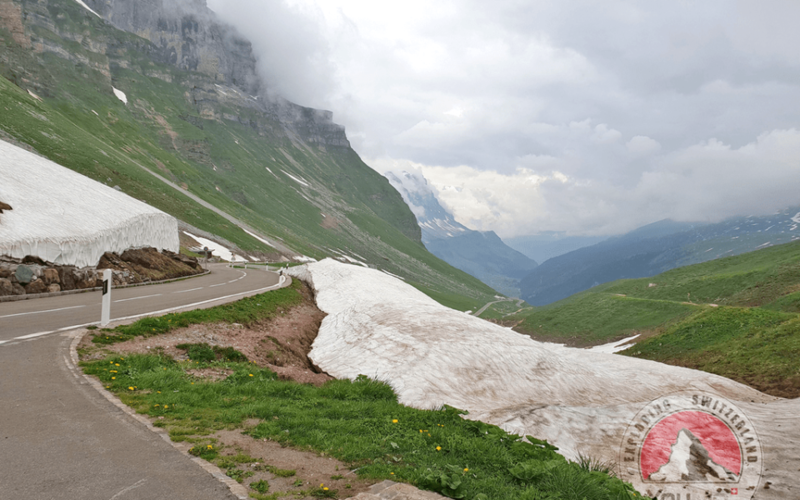 From Vex follows the next spectacular and winding descent down to Saint-Léonard on the Route d’Hérens. 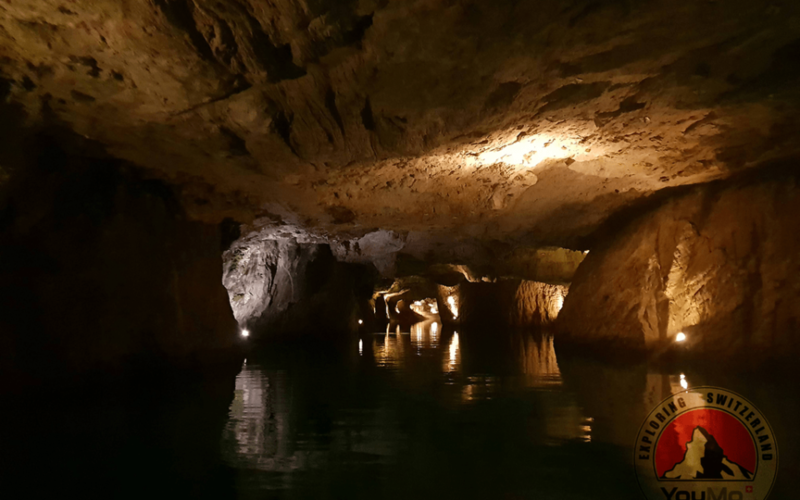 In Saint-Léonard the next highlight of my Swiss tour follows: I visit the largest underground lake of Europe. The ticket for the thirty-minute boat tour on the lake costs CHF 10. The cave is beautifully exposed, and I dive directly into another world. The guide and boat guide in one tells the history of the lake during the trip. The cave creates very special acoustics, and monthly concerts are held on the lake, which can be experienced from the boat. After this experience I cycle for about 1 hour along the Rhone to Visp, where I take the turnoff towards Saas-Fee and Zermatt. After a short flat passage I take the first more or less steep ascent towards Stalden. A local tells me that Stalden is the driest place in Switzerland. I can’t really believe it, but my research in the internet confirms his statements, with about 545 mm it rains three times less in Stalden than e.g. in Lugano with an average quantity of 1559 mm. After Stalden and further ascents through the villages of St. Niklaus, Randa I reach Täsch at about 1450 meters after about 1 ½ hours. Täsch, the last village before Zermatt, is covered by multi-storey car parks, as this is the last stop for most drivers. Only vehicles with permission and, of course, bicycles can enter car-free Zermatt. So I drive through Täsch and tackle the last stage with another 150 meters of altitude difference to Zermatt. Although I am on the road to car-free Zermatt, several cars meet me every minute with a special permit. As I hear in the evening from two ladies who work in the tourist office in Zermatt, everyone who lives in the village or who works in Zermatt receives such a permit quite simply. For drivers without a permit, however, it will be expensive. After another 20 minutes from Täsch I finally reach Zermatt. It took me no less than 28 years to see the Matterhorn with my own eyes for the first time, and I now know why this mountain is so fascinating for tourists and mountaineers alike. I just can’t get enough of this majestic view, and so I find myself cruising through the village of Zermatt again and again, as my gaze automatically goes up to the “Hörnli”. Zermatt is currently in mid-season, and somehow the place seems a bit extinct. Many restaurants will also not resume summer operations until mid-June. The two ladies from the tourist office tell me that the low season is also special for the locals. In the village, for example, you suddenly recognize your neighbours again, where otherwise only tourist streams are on the way every day. Zermatt has about 5500 inhabitants and 32’000 beds for tourists. For every inhabitant there are thus almost 6 guests in the high season. I also like Zermatt in the low season, and I think it’s a pity that I’m leaving again tomorrow on an e-bike. But I’m sure I’ll be back for a long weekend. After a good night in Zermatt today I am convinced that I am going over my first bigger pass over 2000 meters, the Grimselpass to Meiringen. As I sit at the breakfast table and study my exact cycling route, I notice that the Grimsel Pass is still closed. At the beginning of May before my bicycle tour I checked the passports, and it was stated that they will probably open on 01.06.2018. Unfortunately the snow clearance is behind schedule due to a long winter, and so my alternative passes Nufenen and Sustenpass are closed in addition to the Grimsel Pass. Only the car transport over Furka is open. So for the first time on my tour I have no other choice but to do a section with a track. The lady from the Matterhorn-Gotthard Railway, who runs the car transport in Furka, confirms on the phone that it is also possible to load the bike and then travel on from Realp. So today’s planned final destination Meiringen probably won’t turn into anything, and I set course towards Furka car transport and then decide spontaneously where I want to spend the night. From Zermatt it goes the 30 km long way from yesterday back into the valley to Visp. In Visp I take the turnoff towards Brig, and after a short drive I reach the village Bitsch, famous by the media. After Bitsch follow the villages Mörel, Filet, Betten and Fiesch, from which one reaches Riederalp, Bettmeralp and Fiescheralp by cable car. If you take the train from Fiescheralp to Eggishorn, you have a wonderful view over the Aletsch Glacier, the largest and longest glacier in the Alps. I don’t have time for an excursion on Egishorn, and so I continue to trample on a continuous ascent to the Upper Valais. Day 8 of the Swiss Tour starts with a fast, 25 km long descent along the Reuss through the Schöllenenschlucht. 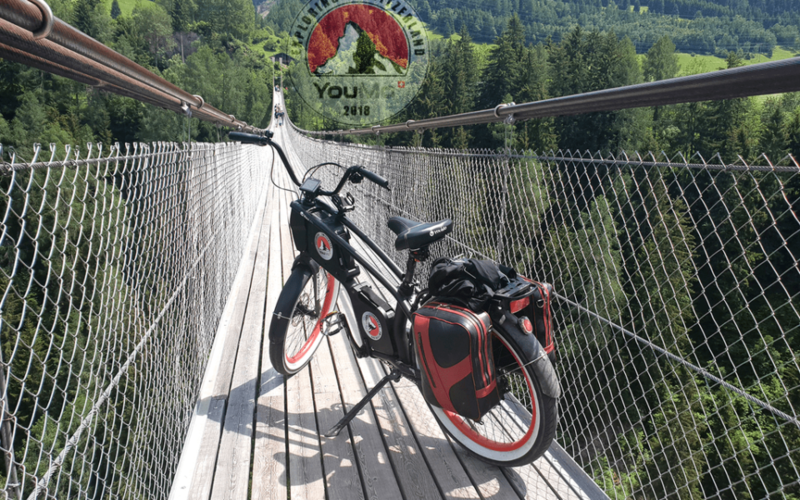 After the Teufelsbrücke bridge, the narrow pass curves of the Gotthard road are tough, and I try – very sportsman – to keep up with the drivers with the YouMo. And with the exception of a Mercedes, I win the downhill price because the YouMo gets around the pass curves faster and more agile than the cars. When I reach the bottom of the Uri valley, I follow the valley towards Altdorf, where I turn left towards Seedorf. I drive directly along the Seestrasse to Bauen and enjoy the wonderful view over Lake Lucerne. Vrom Bauen my bicycle navigation shows me a narrow path, which leads steeply up along the rock face. After the hiking trail in the Creux du Van I ask one of the locals if I can go there by bike to Seelisberg. He shakes his head vehemently and says that there are about 100 steps up and that it is certainly not suitable for bicycles. 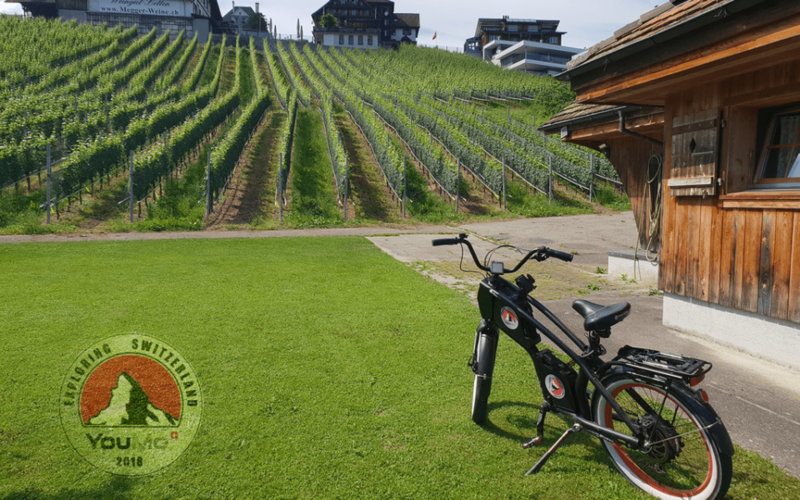 He recommends that I take the ship from Bauen to Rütli and then take the steep gravel path to Seelisberg, which is passable for an e-bike. 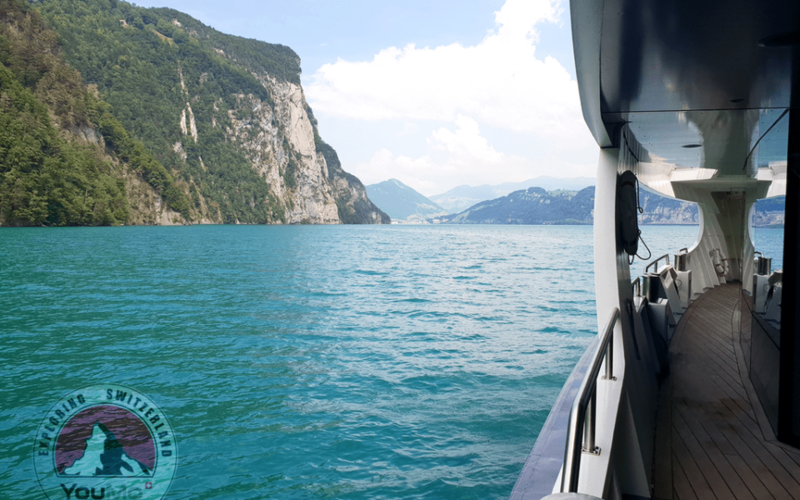 So, in addition to my bike load at the Furka, there is also a little boat trip on Lake Lucerne. From Bauen, the scheduled boat heads for the Rütli landing stage after about 10 minutes. On the boat I am the only cyclist, and so a group of senior citizens ask me what I am doing here – I tell them about my tour and explain my e-bike. At the Rütli, the waiting visitors are not badly astonished when I first leave the ship on my e-bike. From the landing stage the gravel path goes steeply up to the Rütli meadow, where I take an obligatory photo and prepare myself internally for the altitude meters to Seelisberg. 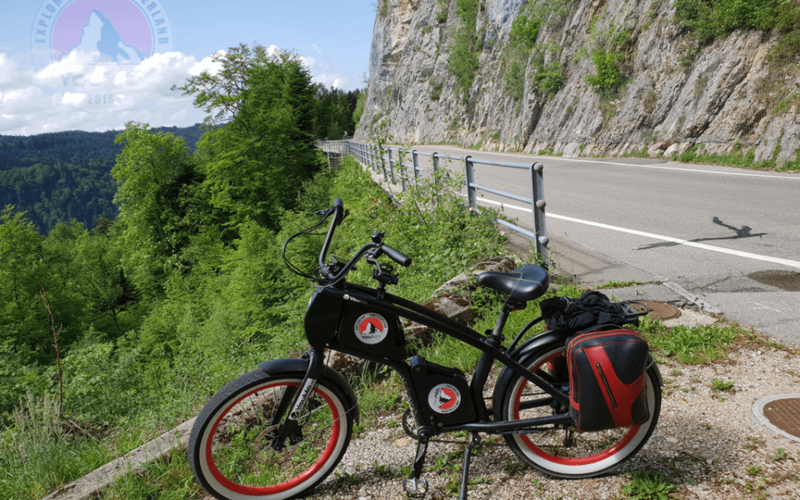 The Rütliweg to Seelisberg is really very steep and not recommended for a leisurely bicycle tour. On the 5 km long gravel path you make about 500 vertical meters and you will be rewarded with a wonderful view. Along the high plateau to Emmetten, where the descent to Oberdorf Beckenried follows. I spontaneously decide to stop by Beckenried and take a short bath in Lake Lucerne. Then we continue to Stans and from there to Kerns. Instead of driving along the bottom of the valley, I decided to drive over the relatively unknown Ächerlipass. But before it goes another 1000 meters uphill, I get some refreshment in a shop in Stans. It’s incredible what I’ve been taking in food and fluids these last few days anyway. Here is a short list: Breakfast every morning (normally I don’t eat much breakfast at all, because I don’t bring down a bite in the morning), after 2 hours drive first break with 1 banana and 1 sports bar, lunch in the restaurant, in the afternoon another 2 sports bars plus something sweet, in the evening an extensive dinner. I take about 6 litres of liquid a day. So when I shop in a shop, it looks like I’m getting ready for a wartime… In any case, I’ve been back in the shop in Stans for a long time and I’ll be happy about it later. After Dallenwil it goes really steep uphill to Wiesenberg. The well-known yodel club Wiesenberg comes from Wiesenberg, which was even represented in the hit parade with the cover version of Ewigi Liebi. Fortunately, the road is currently closed to motorists due to construction work, so I can use it entirely for myself. Since it goes so steeply uphill at the beginning, I have to drive up the road in an “S”. During the pass trip it starts to rain, and I have to fight against my inner pig dog, that I don’t turn back and take the comfortable route along the valley. After a short thunderstorm front, however, the sky opens up and my mood improves with every meter I get closer to the top of the pass. At the top I have a wonderful view and the exertions are quickly forgotten. After about 13 km of descent from the top of the pass I finally reach my accommodation in Flüeli Ranft at 7 pm. Flüeli Ranft is situated on a hill above Lake Sarnen and offers a wonderful view of the Melchtal mountains. 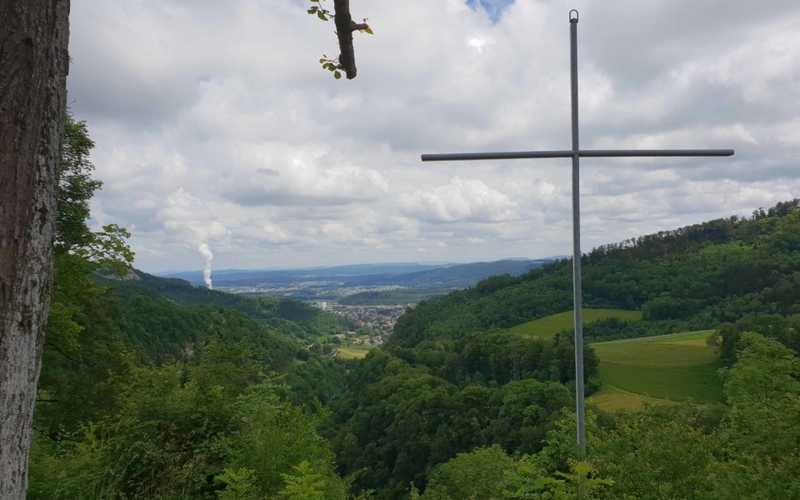 The village is also the home of the Swiss national saint Niklaus von Flüeh, known as Brother Klaus, and thus a popular pilgrimage town for believers. The village of Flüeli Ranft is part of the inventory of the townscapes of Switzerland worthy of protection. Here I settle down today in the Gasthaus Paxmontana and look forward to my stage tomorrow. Today’s tour takes me over two Alpine passes to Grindelwald. Although not very long in terms of kilometres, I have a certain respect for this stage with two Alpine passes. 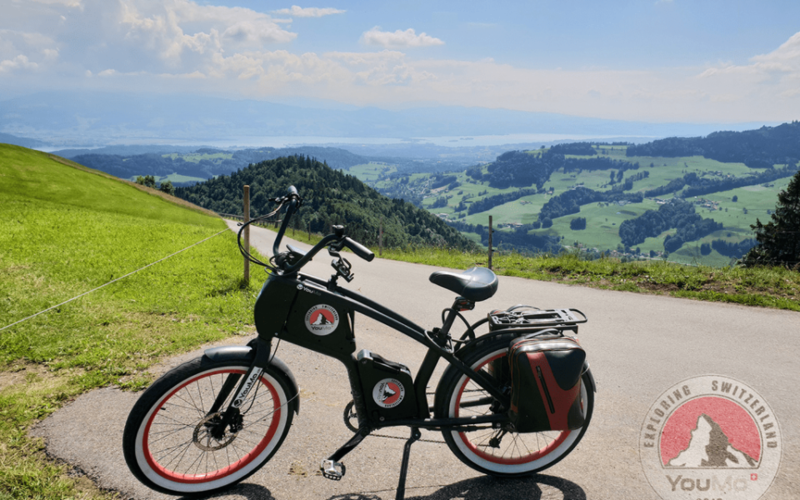 In the morning the tour starts with a short descent to Sachseln, then past the Sarnersee to Giswil, from Giswil the Brünigstrasse climbs slightly up to the Lungerersee. I do not drive along the main road on the Brünigstrasse, but take the cycle path around the Lungernersee. This gravel path along the lake, away from the traffic on the Brünigstraße, is beautiful and absolutely recommended for a bike tour. 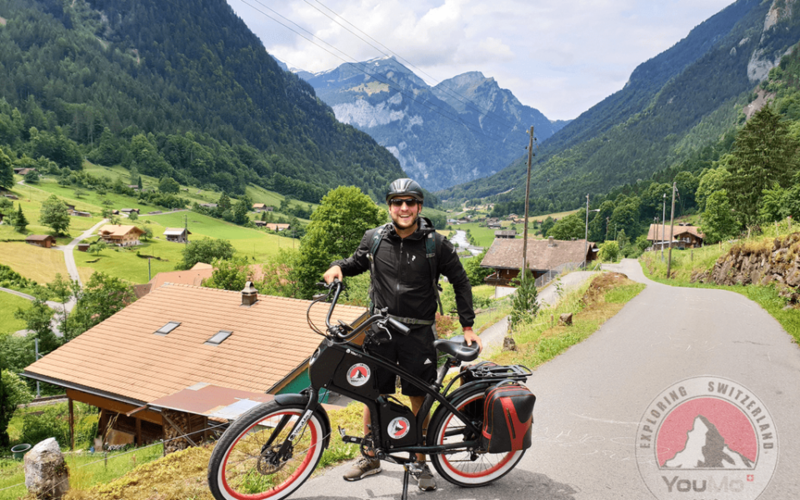 After this breather, I return to the Brünig Road at Lungern to climb the Brünig Pass at 1008 metres above sea level, which connects the cantons of Bern and Obwalden. With an average gradient of 4.2%, the climb is very humane, and from Giswil there are “only” about 450 metres of altitude to overcome. 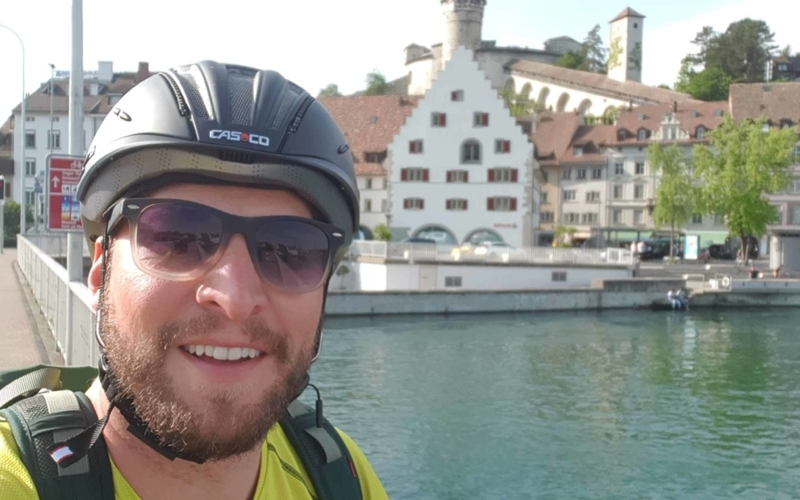 After this first pass, my body warmed up for today’s great challenge: conquering the Grossen Scheidegg, which connects Meiringen in the Haslital with Grindelwald. The Grosse Scheidegg is closed to car traffic and is only used by the post bus. This makes the single-lane Grosse Scheidegg a popular destination for cyclists. 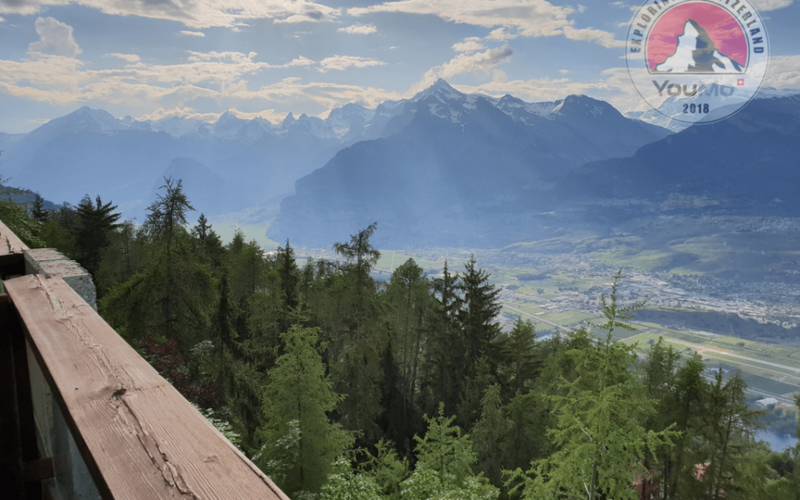 From Meiringen (595 metres above sea level), the route is only 19 kilometres uphill with a fairly steep gradient. On these 19 kilometers one makes approximately 1400 altitude meters up to the pass height on 1962 m.ü.M. My bicycle navigation gives me as approximate time approximately 2 ½ hours, and I am firmly convinced to complete this stage in shorter time. I ride on the smallest possible support, and so my e-bike with all my luggage feels like a normal bike. Especially on the last few kilometres I fight for every meter and it feels as if the pass never wants to end. After every kilometre I have to stop again and again and take a short breather, as I have no more strength in my legs. I am really relieved when I reach the pass after about 2 ½ hours driving time. Undercutting the time on the GPS wasn’t on today. I can’t imagine repeating this pass crossing with a normal bike in the near future and I wonder how the cycling professionals can conquer a 19 kilometre long pass without stopping at such a horrendous speed. I leave these questions in the room and look forward to my forthcoming departure. I ride the 8 km long descent to Grindelwald at a leisurely pace, because the old road with some potholes does not allow a fast descent. So I have time to enjoy the mountain panorama around Grindelwald with the Eiger, Mönch and Jungfrau, and discover beside the pass road how a fox hunts marmots. I stop briefly and watch the spectacle, which is unique. After about half an hour I reach Grindelwand and see my girlfriend for the first time since the start of my Swiss tour. 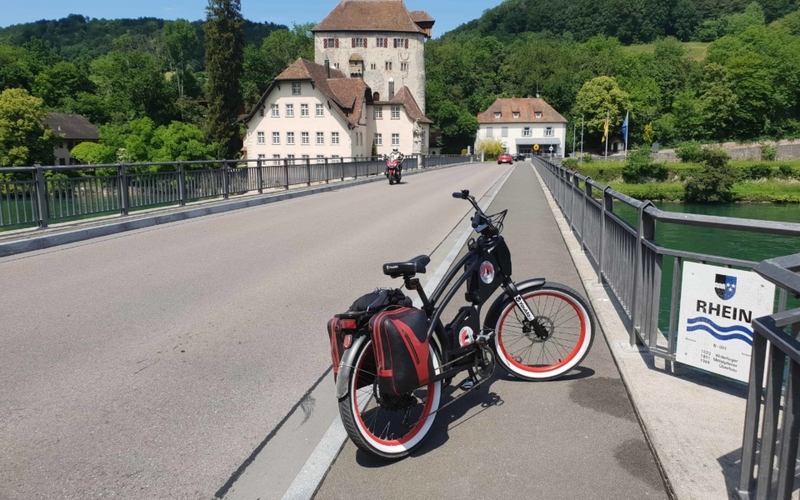 She has just arrived by train to Interlaken, rented a YouMo for two days from Flying Wheels in Interlaken and cycled from Interlaken to Grindelwald. We explore after a shower together with our YouMos Grindelwald and look forward to driving a part of my tour together tomorrow. Since both of us have never been on the Jungfraujoch on Top of Europa , we decided the evening before to go up there together without YouMos. But as my father has already warned, it will be an expensive project. The trip by train from Grindelwald to Kleine Scheidegg and from Kleine Scheidegg up to the Jungfraujoch without any discount costs as much as CHF 219.00 for one person. However, there are so-called early bird tickets (as in the open air), which are cheaper, but you have to take the first or second train in the morning and depart again from the Jungfraujoch around noon. For one person without Half-Fare travelcard this costs CHF 135.00 and for one person with Half-Fare Card CHF 85.00. We also find these early bird prizes still exaggerated, and the helpful lady at the counter understands us too. She also finds the prices, which were increased again this year, a cheekiness. We also ask you how the distribution is between Swiss and tourists visiting the Jungfraujoch, and she feels that over 90 percent of them are tourists from abroad, especially from Asia. In the morning we have to get up at 06:30 am, have breakfast and take the second train from Grindelwald at 07:41 am. Already in the morning the track is full and we feel like strangers. In terms of feeling, around 95% of Asians are sitting on the train, and we are the only two Swiss who want to go to the Jungfraujoch. The conductor also looks at us a little strangely when we answer in dialect and not in English. Arrived on top of the Jungfraujoch, we enjoy the panorama over the Aletsch Glacier. Unfortunately, the day is cloudy, and so we do not see the top of the Jungfrau and the Mönch. 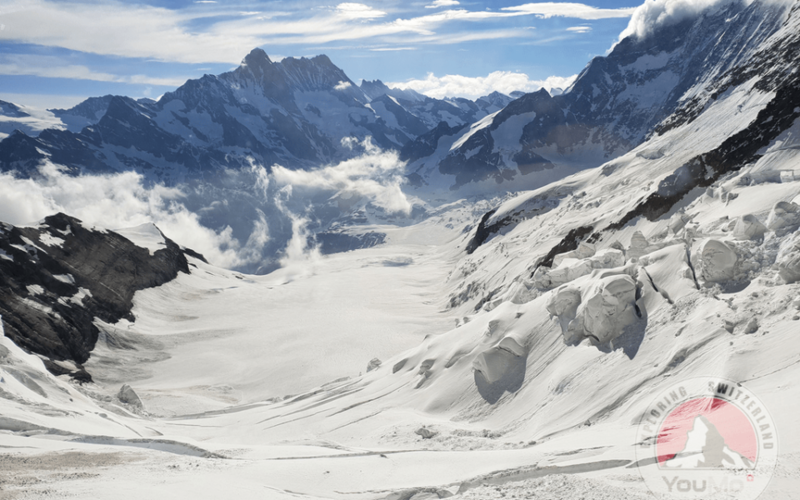 However, the panorama over the Aletsch Glacier is wonderful. The exhibition on the Jungfraujoch and the ice sculptures are also beautifully made… But nothing more! So we’ll be back down in Grindelwald soon. My conclusion after this trip to the Jungfraujoch is merciless. Totally exaggerated prices and mass tourism from Asia are definitely not for me. I am also convinced that we have so many beautiful mountains/viewpoints in Switzerland, where you can also enjoy a wonderful panorama for a fraction of what we paid for the Jungfraujoch. I therefore recommend all readers to visit my local mountain, the Säntis in Alpstein (without GA/Half-Fare travel 45.00 with Half-Fare travelcard for 22.50 CHF) rather than to drive to Grindelwald for the Jungfraujoch. Arrived in Grindelwald, we pack our YouMos around noon and drive out of the valley to Interlaken. Since it goes practically only downhill or straight ahead we reach Interlaken in about 45 minutes. From there, the route continues along Lake Thun. We picnic directly at the lake and drive on to Spiez, where we enjoy a cool blonde in the afternoon. Here unfortunately our ways separate, and my friend drives back to Interlaken and I further to Thun. 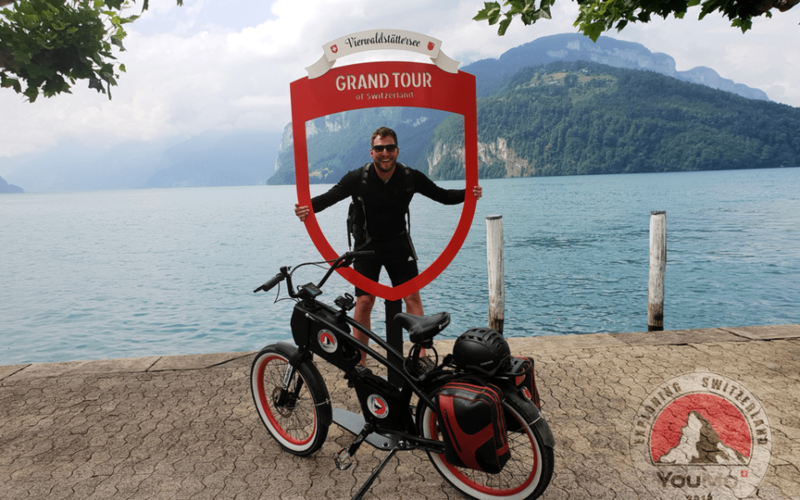 From Thun we continue tomorrow in the direction of Central Switzerland. It rained heavily that night and the day starts with a cloudy sky. The departure yesterday from my girlfriend, the 120 kilometres to be completed and the bad weather press on my motivation, and for the first time I have trouble to get on my saddle and start cycling. What I learned during the tour is to always divide the daily stage into smaller stages with intermediate finishes and not always to see on the display how many total kilometres still have to be completed. And then simply to take kilometers by kilometers – so then each stage is feasible. Unfortunately, I don’t notice much of the nature and surroundings in the Emmental today, because the hills on both sides are covered with fog. So I sink into my own thoughts and cycle along the main road at a steady pace. In Trubschachen I pass the company Kambly, and already from far away a pleasant smelling smell rises from the Güetzli production into my nose. After Trubschachen I drive across the beautiful Entlebuech, but since it is so cloudy, I don’t get so much of the surroundings and nature here either. Only when I cycle towards Lucerne in the afternoon, the sky opens up and the sun begins to push through. When I arrive in Lucerne around four o’clock and treat myself to an aperitif at Kappelerbrücke, the sun finally shines again. For me personally, Lucerne is one of the most beautiful cities in Switzerland. The location directly on Lake Lucerne, the pretty Altstatt, the Kappeler Bridge, the panorama with the mountains and then the friendly Lucerne people, all this makes me feel at home in Lucerne. While enjoying the aperitif, as every day I start looking for a place to stay. Since the cheap hotel rooms start without much comfort in Lucerne at 140.00 CHF per night, I decide to stay a little outside Lucerne. I am always amazed at how expensive simple accommodations and rooms are in Switzerland. My cheapest overnight stay on the trip was for about 55 CHF in a simple room with shower on the floor. In Menggen I find a B&B for 80 CHF per night incl. breakfast directly at the lake. So I cycle the 8 kilometres from Lucerne to Meggen and get a friendly welcome from Mrs. Sigrist, the owner of B&B Weingut Letten. The decision to stay outside Lucerne was the right one. The B&B is located directly at the lake in the middle of a vineyard and has a private bathing place directly at the lake. After a bath in Lake Lucerne and the evening at the Sunset Bar Lucerne, I fall into my bed again, tired. Today’s tour from Meggen to Glarus is kilometres long and metres high. Furthermore, my last alpine pass, the Klausenpass, which is popular with motorcyclists, is on the program. After the start in Meggen my tour leads me along Lake Zug and Lake Lauerz towards Brunnen SZ. From Brunnen, the scheduled boat regularly sails directly to the Rütli and is therefore a popular starting point for tourists visiting the Rütli. Brunnen with its small village centre with many restaurants, bars and shops for tourists invites you to linger. 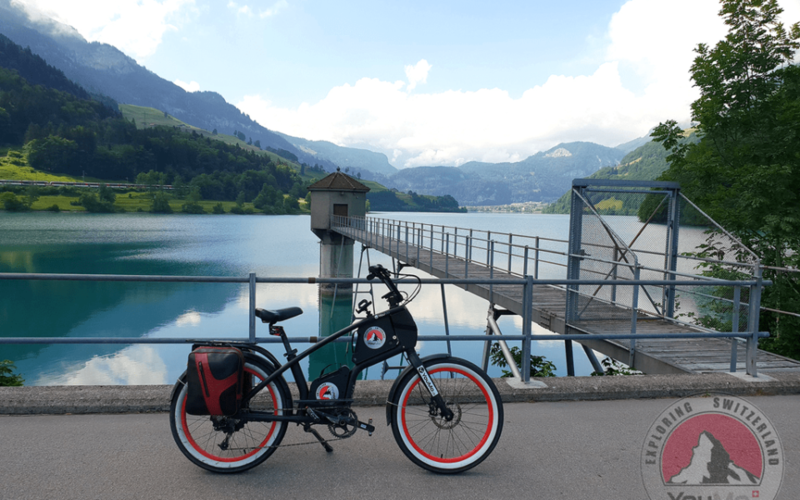 After a short break in Brunnen I cycle along the eastern side of Lake Lucerne towards Flüelen. From Flüelen to Altdorf, where I take the turn-off towards Bürglen and Klausenpass. From Aldorf, it is 24 kilometres to the top of the pass, with an altitude difference of 1609 metres. In cloudy weather with the smallest support (so that the engine does not overheat) I need about 2 ½ hours for the pass, until I arrive totally wet sweaty at the top. In the Restaurant Hotel Klausenpasshöhe I research on the internet how long professional cyclists need for the Klausenpass. In 2008 a time trial from Altdorf to the Klausen pass took place at the Tour de Suisse, which was won by Roman Kreuziger in 1 hour and 22 seconds. He was on average up the pass at about 24 kilometers per hour, an unimaginable speed for me when I have to fight my way up the mountain with about 10 km/h despite support and have a short break every 2-3 kilometers to catch my breath. However, a professional cyclist covers around 30,000-40,000 kilometres per year, which corresponds to an average of 82-109 kilometres per day. 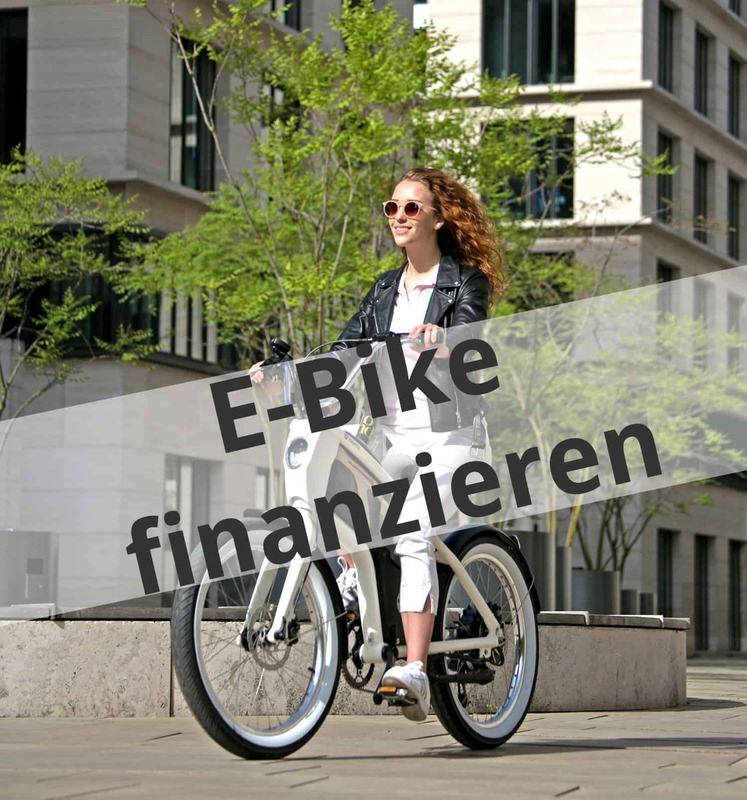 During the tour I will cover about 1400 kilometres, and with the preparation I will make it to about 2,000 kilometres on an e-bike this year. With about 15x less training kilometres, I may also need about 1.5 times as long for a pass as a professional cyclist and get ready for the descent. The winding descent on the east side of the Klausen pass is really fun, and after a flat intermediate section on the Urnerboden, it continues in the same style as far as Linthal. I continue along the Linth River for another 17 kilometres until I reach my destination for the day, Glarus. In Glarus I am already expected by a good friend who pays me a visit on my tour. I look forward to a good dinner and a few drinks in Glarus. Since it got a little late last night, we don’t start until about 11 o’clock today. I’m glad that I drank a little water yesterday at the end of the day, so I don’t feel any big aftermath. The route leads out of the Glarnerland to Niederurnen. Then turn right into the canton of St. Gallen and follow the Linth until you reach Uznach. The route along the Linth is a nice straight cycle path, and along the Linth there are always small meadows with bathing places that invite you to swim. From Uznach in the canton of St. Gallen, the route leads up past the municipality of Berg in the direction of the forest in the canton of Zurich. On the way I decide to take a detour to Alp Scheidegg. I had wanted to visit this highest inn in the canton of Zurich for a long time, and as I am driving through the forest today, I spontaneously decide to accept the few additional vertical meters. From the forest it goes a 6 km long distance up to Alp Scheidegg at 1200 meters above sea level. The first 4 kilometres are easy and the climb is very modest, but the last two kilometres are all the harder. On the last 2 kilometres the average gradient is 16%, so I have to take several breaks until I reach the top. However, the view of Lake Zurich from Alp Scheidegg is breathtakingly beautiful. Paragliders also take off from Alp Scheidegg every minute. The restaurant with its wonderful terrace is very beautifully designed, and the food is also very fine. I treat myself to an Alp Scheidegg Cordon-Bleu with vegetables and fries before I start the last part of my tour. After the descent from Alp Scheidegg I drive through the upper Töss valley along the communities Fischenthal, Bauma, Wila and Turbenthal. The cycle path runs for the most part directly along the Töss and is really recommended for a Sunday cycle tour. After Turbenthal follow the villages Zell and Kyburg. On top of the hill stands the famous Kyburg Castle, which is absolutely recommended for a visit. 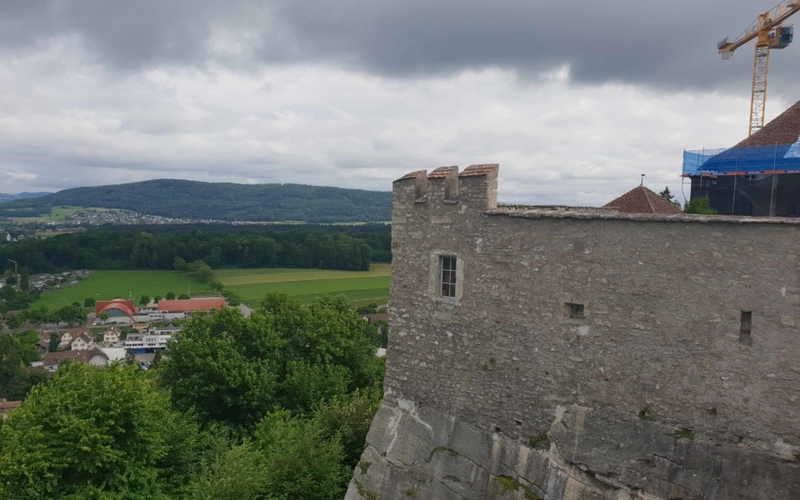 In Winterthur I drive directly through the beautiful Old Town, and since I live near Winterthur, I know that the second largest city in the canton of Zurich does not have to hide in terms of cultural offerings, activities and restaurants. Besides the annual Albani Festival, the Streetfood Festival, the Winterthur Music Festival, the Afro-Pfingen, the Winterthur Oktoberfest, the Winterthur Spring Festival has attracted many visitors since this year. Winterthur has long since transformed itself from an industrial city (Sulzer, Rieter etc.) to a city of education, leisure and culture. The ZHAW Zurich University of Applied Sciences, with its headquarters in Winterthur, is now the third largest university in the canton of Zurich, and the canton plans to invest a further CHF 500 million in Winterthur as a university location by 2025, meaning that Winterthur is ready for the future. After my drive through Winterthur the last small section follows to Unterohringen. Around six o’clock in the evening I reach my home and the starting point of the tour tired but overjoyed. Above all, I am overwhelmed by the various impressions I have gained of beautiful Switzerland and I am glad that I was able to finish the tour as planned without falling and injury and without major breakdowns. 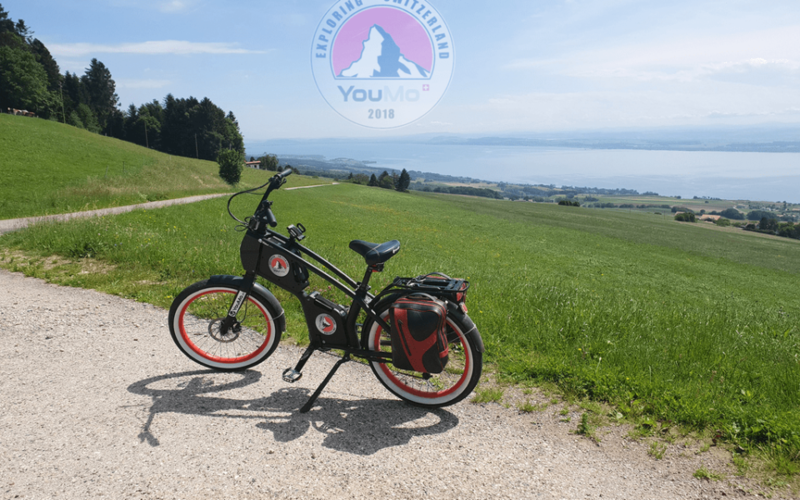 Many thanks to YouMo and their owner Knut Späte, who supported me in my project from the beginning and provided me with their really cool e-bike for this tour. 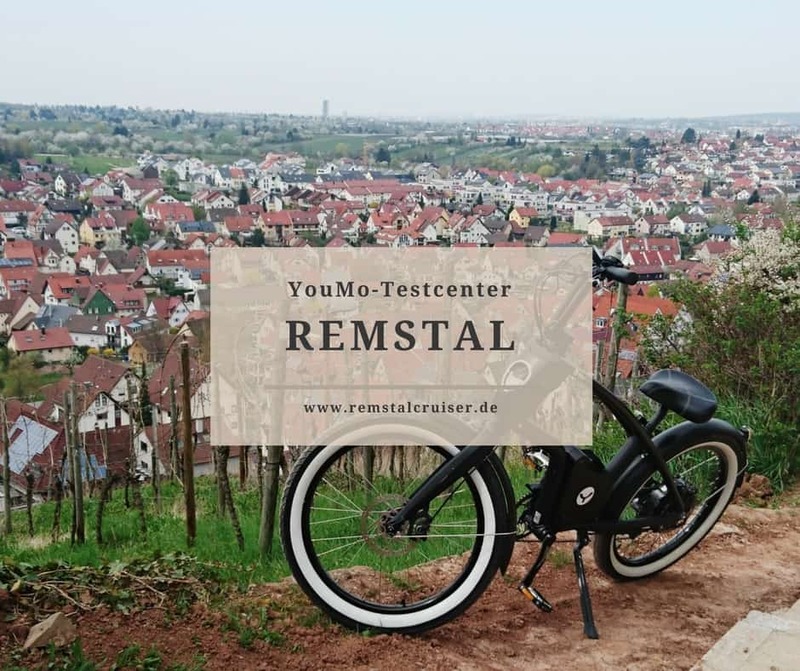 Now, dear readers of this blog, have fun on your next bike tour (of course with the YouMo;)) and hope that I could give you some new inputs and ideas for your route!